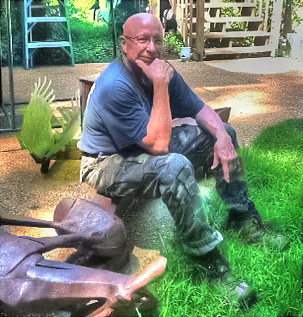 Paul Hill lives and works in Wilmington, NC., where He maintains Hill Designs aka: Paul Hill Sculpture Studios. "Born in Tyler, Texas. The normal grade school, high school, some college, got drafted stuff. After the army, I had a small, readjustment period but college was never the same for me. I mostly had a stubborn mind of my own and an "I am going to do it my way" attitude. Well, now I look back - maybe should have listened a little closer to some people - I guess I will never know. But it is, and believe that it has always been, sculpture, that has hibernating in my soul. Once awake, this medium has totally captured my passion. Each new piece begins a new drive to create and refine my work - to make the next piece contain as much information about myself as to what is visualized in the physical, tangible sculpture. My intent is capture the human emotions, expressions and feelings into the creatures I create - through means of posture and character. So I continue this journey - this wonderful experience that continually excites and frustrates - but always knowing there is ever more to create and even more to learn… and maybe listen! - Have spent the last 35 years as a self-employed artist. North Carolina Arts Council of Wilmington and NHC. 2010/11, “For No Apparent Reason.” One of 10 Sculptures. Cary Visual Art; Cary, NC Annual Outdoor Sculpture Exhibition, 2008/09 - Exhibition of "Natural Progression" at Cary Town Center Campus, one of 10 sculptures.